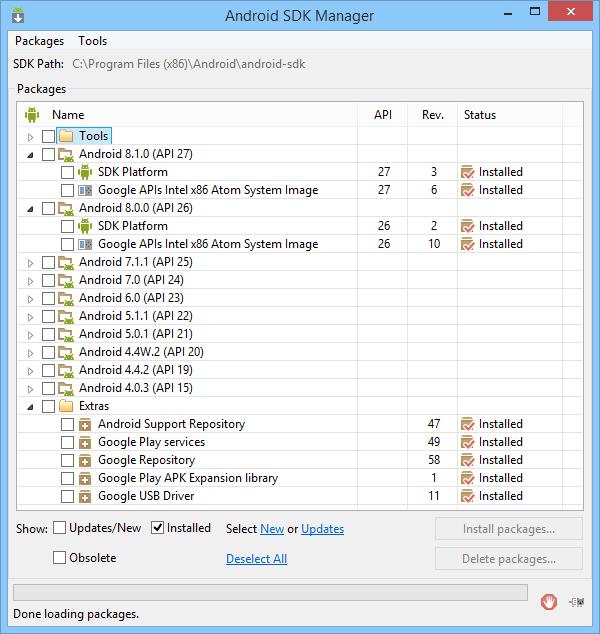 Android SDK manager can be used to get and update your Android APIs easily. Your Android 8.x and 9.x system images (API 26 and newer) refuse to start. 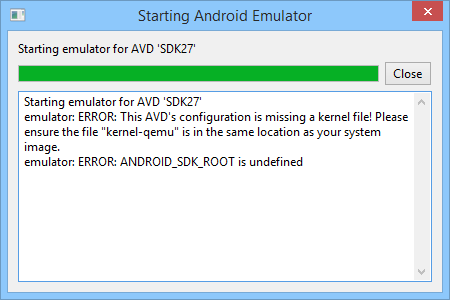 ERROR: This AVD’s configuration is missing a kernel file! Please ensure the “kernel-qemu” is in the same location as your system image. 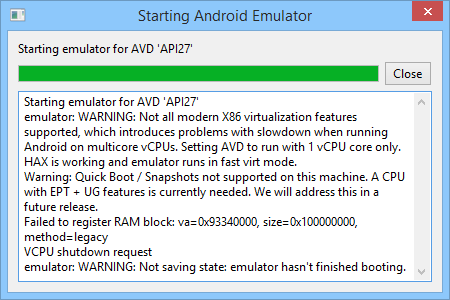 Errors starting Android Emulator API 27 with SDK tools 24. Starting from API 26 (Android 8.0.0) and onwards, system images are incompatible with the aging Android SDK tools version 24 and will throw all kind of startup errors or refuse to run. If you have already updated the Android SDK tools to version 27 or newer and still get emulator related errors, please keep reading to ensure your emulators have been setup properly and according to your hardware. If you are using Visual Studio 2015 or 2017 with Tools for Apache Cordova and want to use the latest SDK instead of using the obsolete API25 and emulators provided by Visual Studio, set your ADT_HOME path to the location where you have installed the SDK using the following instructions. This path can be set in Tools > Options > Tools for Apache Cordova. Update your Android SDK emulator to version 27 or newer. Do not use the SDK tools from Android Developers downloads, these won’t work with the SDK GUI tools, as they are all command line executables only. If you don’t have Android SDK tools 24.4.1 already, download and install it. This is the last version that features the standalone SDK Manager and AVD Manager GUI apps, before the release of Android Studio. Uninstall your current Android 8 and newer System Images. Close your Android SDK Manager and AVD Manager tools if open. Windows: The ZIP file contains a tools folder that must be copied over your current android-sdk/tools folder. MacOS: The ZIP contains an emulator folder that must be merged with your android-sdk/tools folder. Do not use the Apply to all folders option when copying contents from the ZIP to the tools dir. Launch SDK manager and check if the version in the About dialog is latest. The emulator linked here was released on July 9, 2018. Check out the release notes for more info. (*) Some links here have been taken from this StackOverflow post by the user xavier_fakerat, make sure to kindly upvote his answer there. After updating your SDK Manager, follow these steps to create your API26 or API27 emulators. Download the desired emulator’s System Images from the SDK Manager. CPU/ABI: Google APIs Intel Atom. Using Google APIs system images instead of regular ones provides access to all Firebase and Google Play Services APIs and libraries. RAM: At least 1024 MB, VM Heap at least 256 MB. 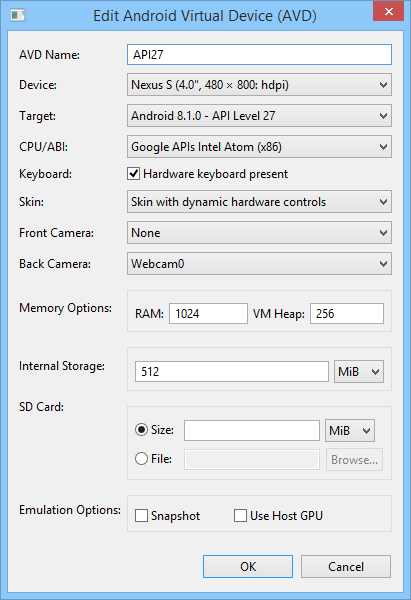 AVD settings for Android 8.1.0 emulator. The higher the API level, the greater the emulator’s RAM requirements will be. Setting RAM too low will cause the emulator to either fail to start, or start but never end booting. Use at least 1024 or 2048 MB for API26 images. Error starting emulator when you don’t have enough RAM. If your emulator fails to start or strange Play Services errors popup randomly, try increasing RAM and VM heap values. With a physical 8GB of RAM you can easily assign 2048 MB if running Windows 8.1 or Windows 10, and still have plenty of RAM available for other applications. If you need to increase RAM to higher values and you get the Failed to register RAM block error, restart your computer and don’t open anything but the emulator first. If this still doesn’t work you’ll need to expand your physical RAM. 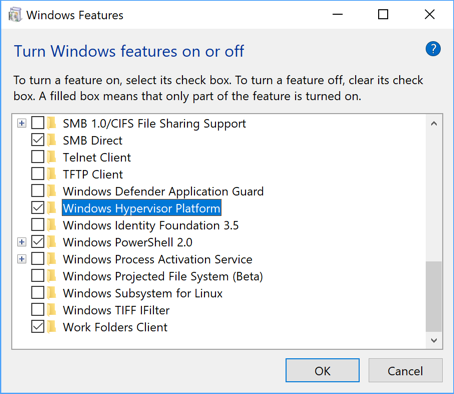 Windows Hypervisor Platform setting in Windows 10. After taking care of the above settings, you’ll be able to run API 26 and newer emulators on your AMD based computer with latest speed and resources usage improvements. 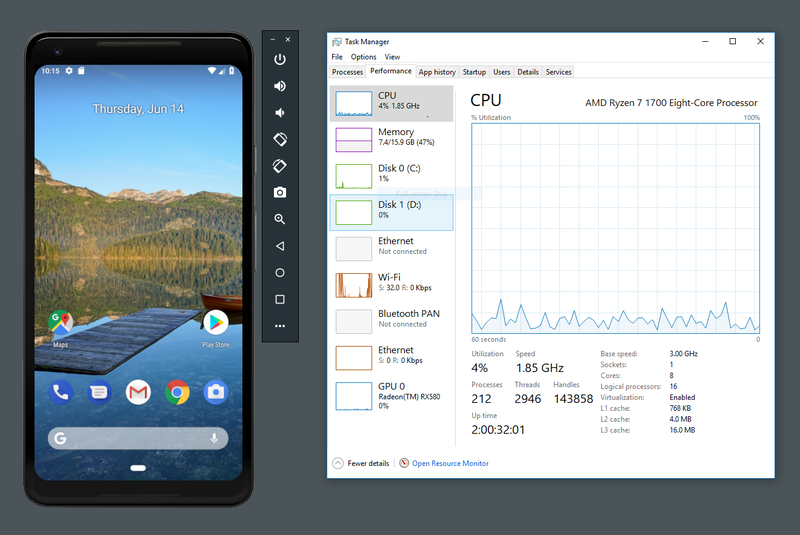 Android Emulator running on Windows 10 with AMD Processor Screenshot Configuration: Asus ROG Strix GL 702ZC, Processor: AMD® Ryzen™ 7 1700 Processor, Chipset: AMD 5350, Graphics: AMD® Radeon™ RX580. If you find an issue that impacts one of the Android Developer tools, such as Android Studio, SDK, Emulator, System Images, or Support Library, you can file a bug in one of these components. If you have other problems with your Android emulator, feel free to post your issue in full detail in the Comments section below. You may receive feedback from me or other fellow developers to help you with your particular case.